grandma's cookie jar: Summer Fun with Pool Noodles! 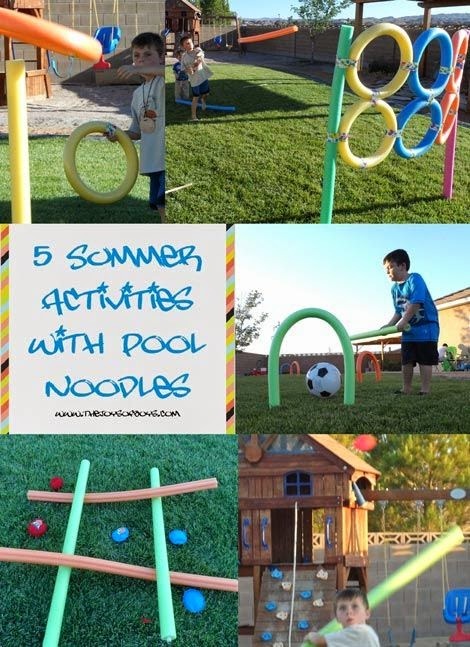 Summer is here and school is out, so if you are looking for something fun which is relatively simple and inexpensive which you can put together for summertime fun, check this link which I found on Pinterest for five fun things you can make with pool noodles! Follow this link and you'll find complete directions for all five games and photo tutorials as well! I think I will need to buy some pool noodles and dowels! Which idea do you think your grandchildren would enjoy the most? I think my grandsons might really like the Pool Noodle Target Station . . . maybe we could make a game of it with water balloons where one boy stands behind the station and the other tries to throw the water balloon through the hoops to hit the one behind the station! My grandsons do love anything where they are playing with water!